Indian born consumer electronics firm Micromax has been quite candid recently. The company admitted that the recent influx of Oppo, Vivo and other players led the company to rethink its strategies. And the Micromax Canvas Evok Note is one of two phones that make up Micromax’s new strategy. 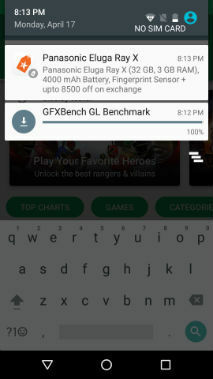 The Evok Note and Evok Power are created in association with Flipkart, in what both the e-commerce giant and the OEM call a “close partnership”. Micromax says it wants to use Flipkart’s “rich insights” to make products that will appeal to an online buyer base. Leading this new thought is the Micromax Evok Note, a phone that looks like many others, but also has distinct Micromax elements to it. 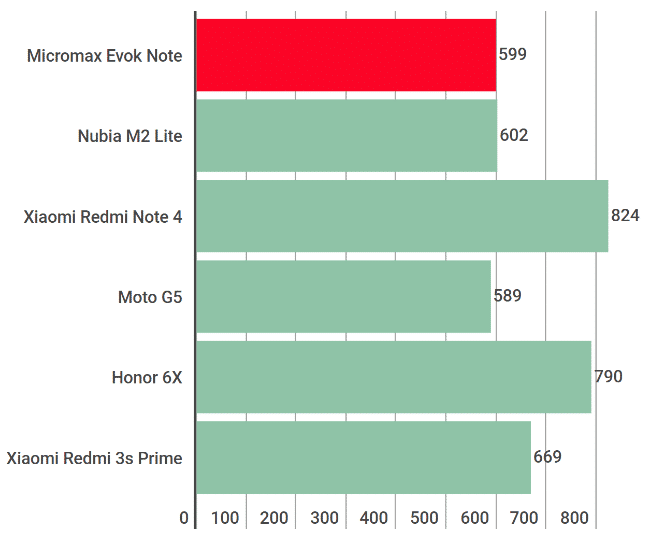 Here’s how the Evok Note fared in our review. There’s not much to be said about the design here. 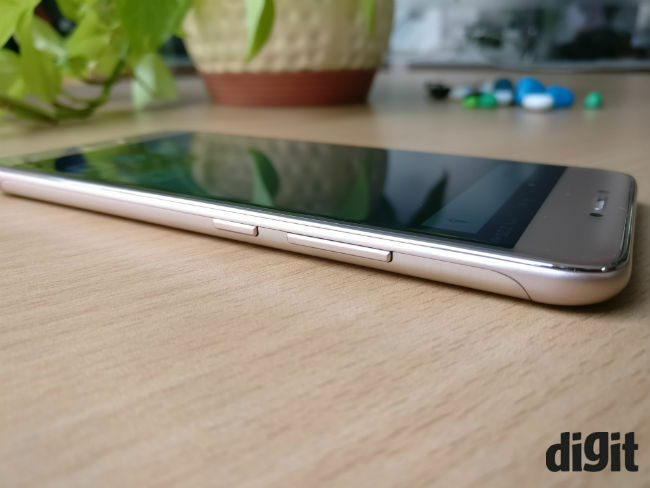 The Micromax Evok Note has the same metal-like shell that most budget phones have today. It’s almost a replica of the Xiaomi Redmi Note 3 (review), with a gold/copper-ish colour tone, and a front fingerprint scanner instead of on the back. So, for all intents and purposes, the Micromax Evok Note is a pretty, but regular looking smartphones. The power on/off button and volume rocker are on the left, while the speaker grille and micro-USB port are at the bottom. There’s a round camera module that sits flush with the back, and the flash is placed vertically right below it. There’s a hybrid SIM slot on the left side of the device, while the headphone jack lies at the top. If I had to pick the most impressive aspect of this phone, the 5.5 inch FHD display would be it. 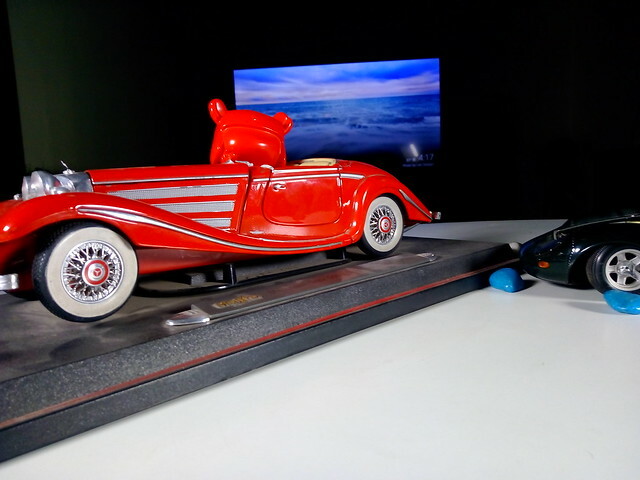 It’s neither the brightest, nor the most accurate display out there, but viewing angles are good and sunlight visibility is just enough to work with. I watched hours of video on this device, and if you can bring good enough content, the display won’t really disappoint. Colour tones are slightly undersaturated, but the display does a decent job overall. Touch performance is also beyond complaints. To be clear, there are far better displays on phones like the Xiaomi Redmi Note 4 or Lenovo K6 Power, but this one is reasonable given the price. Maximum luminance scores of 456 Lux are pretty much around the industry average at this price point. 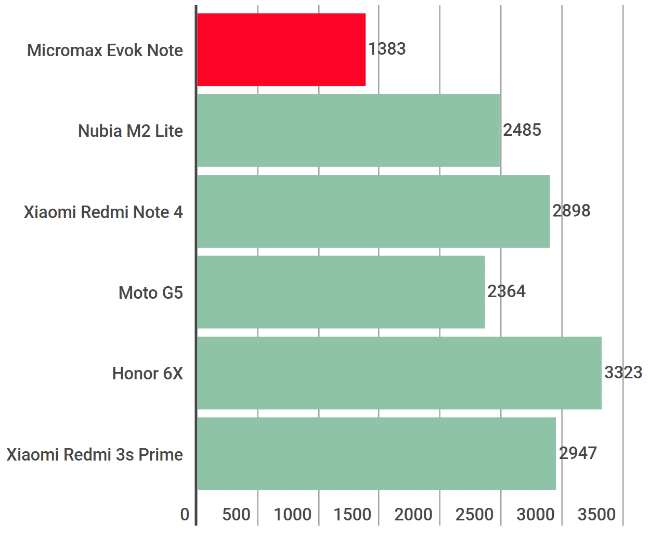 My colleague Hardik Singh reviewed the Micromax Evok Power recently and pointed out a bunch of flaws with that device. Most of those continue here, but I’ll add a few niggles of my own. As with earlier devices from Micromax, there are just too many notifications on this phone. The price comparison app, Scandid is pre-loaded onto the device and keeps suggesting phones you can buy. On the flipside, the app tells you to buy phones from Micromax’s competitors too, so it’s not really being biased towards the company. I even got a notification to stop too many notifications, which is simply annoying. 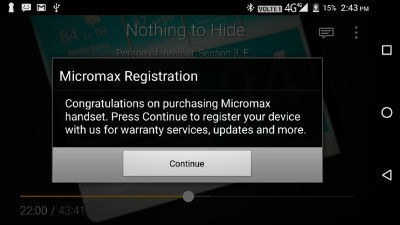 Once, while watching Person of Interest on Amazon Prime, the phone randomly gave me a pop-up, thanking me for buying a Micromax phone (this was about two weeks into the review). Micromax has a method to avoid these notifications, by bundling them all into one app. I'm not sure why I need it though, since I can simply turn off notifications for apps I'm not interested in. Next, the phone runs on Micromax/Yu’s Steroid Launcher, but that’s only a launcher here. One wonders why Micromax would add overheads on the processor when it could just have used the entire Android on Steroids operating system it designed earlier. You get the AroundYu function, which never really took off for the company, meaning that extra screen remained blank for me throughout the review. Lastly, there’s a Secure Vault feature, allowing you to lock private photos and apps where no one but you can reach them. Although I wouldn't trust a device running on a two-year-old OS (Android Marshmallow) to be high on security either. To be fair, Micromax isn't the only one selling phones on Marshmallow still, it's an industry-wide epidemic. The Micromax Evok Note runs on the MediaTek MT6753 SoC, clocked at 1.3GHz. It’s an octa-core chipset with Cat4 LTE capabilities, and is theoretically at par with the Snapdragon 430 chipset from Qualcomm. If you look at phones in the sub-10k bracket, that’s been the chipset of choice for most OEMs. So, the phone is almost at par with competitors, at least as far as raw specifications are concerned. 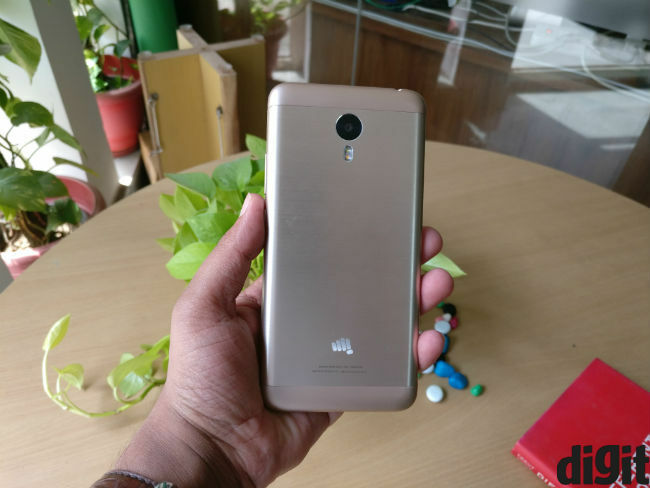 However, it’s nowhere close to a Lenovo K6 Power (review) or Xiaomi Redmi 3s Prime (review) in practical terms. I noticed intermittent lags while navigating around the interface, while Amazon Prime would take quite a while to open. There were stutters while scrolling down the Facebook news feed too, and games returned less than ideal frame rates. For example, Asphalt 8 ran at 25fps at best, which is below ideal. In practical terms, games do feel sluggish and final user experience is well below industry limits today. 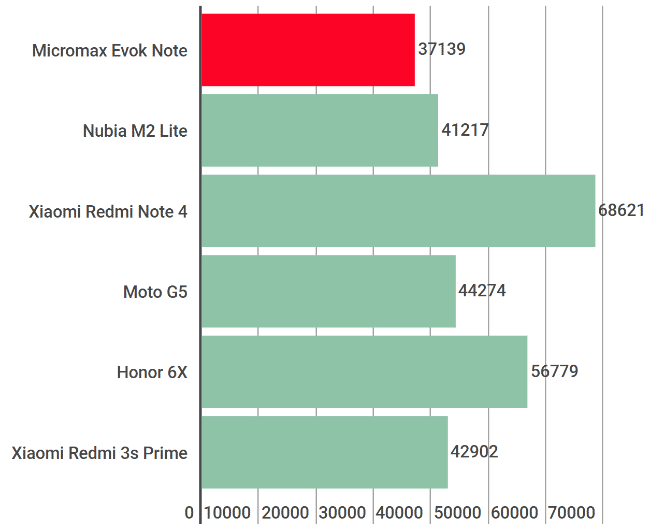 While there were no discernible heating issues, the Micromax Evok Note’s performance feels old school, but not in a good way. Speaking of old school, the 13MP rear camera on this device took me back to 2014. It’s a decent spec to read on paper, but images come with washed out colours and soft edges. Low light performance is really poor, with pixelated photos, distorted colours and heavy noise. It almost feels like a two-year-old budget camera, and I can even think of phones from that time that would do better. The focus here seems to have been on delivering the specs, rather than ensuring good quality. The camera on this phone is easily one of the weakest we’ve ever reviewed at Digit. And while we’re on the topic of specifications, another spec-by-spec match here is the 3950 mAh battery on the Evok Note. Much like other things on this phone, the large battery doesn’t last as long as you’d expect. Moreover, charging times are quite high and there’s no fast charging support either (although no one provides fast charging at this price). That said, the phone lasted 6 hours and 46 minutes on the PC Mark battery test, well below some devices with smaller batteries. On general usage, you’ll still get about a work day’s worth of battery, which is fine, but you’d expect more given that this is being sold as a battery beast. I got about two hours worth of battery life while streaming video on mobile networks, while general usage fared to 12 hours at best. With all that said, it’s no surprise that the Micromax Evok Note is not a smartphone we’d recommend. You may not get this screen size, but the Lenovo K6 Power and Xiaomi Redmi 3s Prime are better devices, with better cameras, displays, performance, battery life and user experience. The Xiaomi Redmi Note 4 (3/32GB) would cost you about a thousand bucks more, but it provides much better value than this as well. If you’ve got a higher budget, the Honor 6X should also be within your reach.